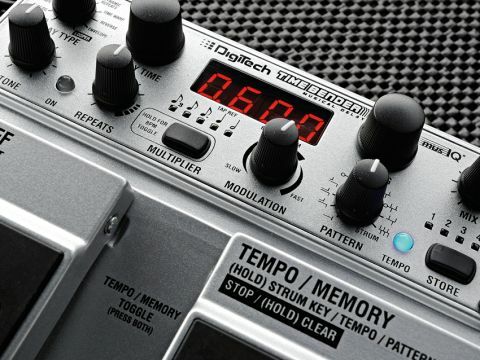 Has DigiTech created a delay for all others to be judged by? A musical tool that combines workmanlike practicality with inspirational creativity. Ease of use. Extremely wide range of sounds. Setting parameters by strumming. Manufacturers are taking two approaches to delay pedals these days. The retro approach gives you a simple three-knob stompbox, such as MXR's Carbon Copy. The hi-tech route involves cramming in as many delay types and features as possible. The DigiTech Time Bender takes the latter path. With many unusual features, DigiTech says it's a delay for all others to be judged by. In addition to 10 different types of delay and a looper, users can create custom repeat rhythms or patterns of up to six taps on the fly by simply strumming the guitar. Intelligent harmonies can also be added to the delays and over 100 different voicings are available. A solid wall-wart-powered pedal with twin footswitches, the Time Bender offers standard mono pedal operation, but has stereo ins and outs as well. There are four onboard memories for storing your settings in and a bright red display that shows the delay time in milliseconds or bpm, as well as displaying other parameter values as you edit them. A bright blue LED always flashes in time with the tempo. The 10 delay types are selected via a rotary switch, plus standard knobs to alter the wet/dry mix, the tone of the repeats and the feedback (number of repeats). You can set delay time with a rotary knob or by using one of the footswitches for tap tempo. Even better, you can also set the tempo by holding down the right footswitch and strumming on muted strings. A 'multiplier' button enables you to divide the delay time/tempo by musical values other than the default quarter-note so you can instantly dial in dotted eighth notes and the like. Whatever delay type you choose you then have a choice of 10 patterns that determine where the delay repeats lie in relation to each other - from standard equidistant repeats through to various dual delays and multi-taps. If you want to go beyond the 10 set patterns you can turn the pattern knob to its 'strum' position and create your own pattern by holding down the right footswitch and playing it in time. The repeats can be modulated via a modulation knob offering slow, medium or fast modulation in varying amounts for chorus/flange effects. But to really take the sound of the repeats one stage further you'll need to make use of the 'voicing' knob, which changes the pitch of the repeats. Set to 'unison' the pitch of the repeats won't change, but there are octave shifts and plenty of intelligent harmonies available - the key for the harmonies can be set by holding down the right footswitch and strumming a chord on the guitar. You can plug an expression pedal into the Time Bender to morph between parameter settings. And you can even add a three-button footswitch so that you can easily access the onboard memories. If you've been following this so far, you'll notice that the Time Bender is a complex piece of machinery, but that doesn't mean it has to be difficult to operate. In fact, everything's very intuitive - getting the sounds you want being a simple matter of turning a few knobs, rather than delving into menus. The 10 delay types cover all the bases. If it's conventional you want, then the standard digital delay and the emulations of older analogue technology offer you plenty of flavour, whether you want your repeats to be prominent or melt away smoothly into the overall sound. The dynamic delays keep the repeats quiet while you play, but let them ring out clearly at the end of a passage. Of particular note is the 'envelope' delay, which is effectively a slicer - chopping up your audio into rhythmic segments in a similar way to the BOSS SL-20 slicer pedal. The 'repeats' knob can create great variation in exactly how the individual slices sound. And by adding modulation and pitch-shifting there's a whole world of pulsing and staccato rhythms available. The delay patterns provide plenty of variations besides the simple single delay - three dual delays with two taps as well as six-tap and three-tap multi-tap patterns. Also available are four root-based pattern delays designed to be used for arpeggiation in conjunction with the pitch-shifting. The pattern begins with the original unshifted note repeated at a specified delay time, followed by the rest of the notes in the pattern. This way, you can turn the voicing knob to, say, produce a third and a fifth and get a musically intelligent arpeggio starting with the note that you played. The ability to pitch-shift the repeats offers both unusual atonal effects and musically related ones. Scalic and triad-centred voicings are musically valid, provided you stay in the right key. But there are also chromatic shifts where the repeats are shifted by a set number of semitones - it sounds odd on some intervals but works well on octaves. The facility to input data by strumming the guitar is very practical and could be a lifesaver onstage for syncing to a drummer. Setting the tempo and the base key on the fly is easily done. The facility to actually strum in a rhythm pattern to give you your own customised multi-tap delay offers you extreme flexibility in creating something unusual, something tailored to fit a particular song or an emulation of a particular head pattern of a vintage tape echo. The 'looping' facility is a nice practical asset, all controlled via the two footswitches, giving you a 20-second recording capability, all with a visual display that lets you know where you are in the 20-second period. The onboard pitch shifting can be active with the Looper, so it's possible to set it to an octave down and record a 'bass' part to play over. If you have an expression pedal handy, you can store a unison voicing in the toe position and an octave down in the heel, so that you can switch between guitar and 'bass' at will. The Time Bender has a dual personality - on the one hand it can do all of the conventional delay tasks with aplomb, while on the other it offers access to a whole different world of sounds. DigiTech calls it a 'musical delay' and that title fits. There's loads to explore, especially in the creation of sequenced musical patterns that could be used to trigger compositional ideas.Simple to operate but advanced in its capabilities, the Time Bender will do all of the delay tasks you ask of it and go the extra mile if you're in need of some inspiration.